This family friendly event is a fun and festive celebration of New Year’s Day. We start the race at 10:00 so you can sleep in a little bit. As with all Fun Run Races, we emphasize the FUN. You will receive a race bib that says, “In 2015, I Resolve TO…” the rest of the bib is blank and entirely up to you if you want to write in your New Year’s Resolution. Have some fun with this! We will give out multiple Best Resolution awards for: Most Sincere, Funniest, Sappiest, Most Creative, Most Disturbing, Most Likely to Warm the Hearts’ of Your Loved Ones, and many more! Stay Warm! The Freedom Aquatic & Fitness Center has graciously opened its facility so participants and spectators can stay ‘warm’ both pre and post race. A DJ will play music from 9:00-11:30. Fun Run Racing is proud to have raised over $12,400 for local charities and non-profits! Fun Run Racing is proud to work with our charity partner the Manassas Bull Run Rotary Club. A portion of all race proceeds support the Rotary and all the numerous local charities they support. Read More. 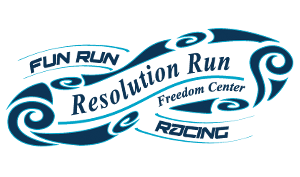 Fun Run Racing is excited to partner with the Freedom Aquatic & Fitness Center for our upcoming race series.Read More. Fun Run Racing’s world famous (yeah right) “Golden Ticket Awards” will be given randomly to race finishers – good luck! All 5K participants receive an awesome long sleeve race tee and a custom commemorative race bib. All 1 mile participants receive a cool cotton/poly race tee and a custom commemorative race bib.